How do I advertise at philcake.com? I want to sell some of my invented items, how do I become a merchant of philcake.com? Choose your preferred item and click add button > Checkout > Guest or Register > Fill up all the information and proceed to checkout. If your order is successful, you will see a page which will tell you "Your order has processed successfully" and you will also receive an email. if you don't see any page which is telling Order Successful meaning your order did not successful and you will need to re order. We delivery same day some items. Please check item details as we specified the lead time of ordering. a. Are you receiving a message telling :There are no items in your shopping cart. Click Here to continue.? In the SHIPPING INFORMATION > The state/province asking in this form for Philippines address, drop down the menu and select OUTSIDE US OR CANADA. Click add button of your preferred item and click CONTINUE SHOPPING and choose your other item and click add button again, if you wish to order more, please click CONTINUE SHOPPING again and shop. Finally click checkout and go ahead with your order. Its possible. You can specify delivery date during checkout. Yes, this way it will be easier for you to purchase again in future and you can monitor all your purchases. Sure! Try to search here > > Product Search or send us email info@philcake.com and write your desired item information, we will gladly prepare it for you. Please email us- info@philcake.com details of your preferred customize order so we can prepare it for you. 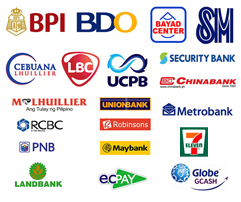 We deliver almost all the places within Philippines. Please see each item description about delivery coverage area. You may specify range of delivery time such as 7-10 AM. We deliver during day time. We have our own delivery team, aside from that nearest bake shop outlet delivers directly to your receiver door step. Yes, we do. However soem rural areas may not covered for delivery. You may email us > info@philcake.com with complete delivery address. Yes, we deliver 7 days a week. You can order using paypal online. Choose your item and click add button and choose payment option PAYPAL. 2CO*philcake com will appear on your card statement.